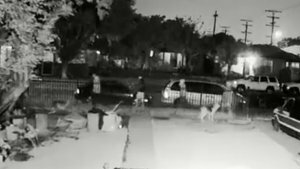 Police asked the public for help Wednesday in their search for whoever fatally shot a dog that was in the front yard of its home in the Green Meadows neighborhood of South Los Angeles earlier this month. The incident occurred about 10:10 p.m. on March 9 in the 900 block of East 91st Street and was recorded on surveillance video, the Los Angeles Police Department stated in a news release. Officers responded to the home after receiving a shots fired call and found the dead dog in the front yard of the home. The dog was taken to a shelter where a veterinarian determined it had been shot. Police later located surveillance video, which showed the killing of the dog. In the video, four people are seen walking next to a fence in front of the home. Two dogs appear to run up to the fence to follow the people as they walked by. Toward the end of the yard, one of the people stops near one of the dogs and a flash of light is seen as the dog is shot. The four people then continue walking until they are no longer seen in the video. The video can be viewed at lapdonline.org. Investigators believe the suspects are possibly four males, but had no further details. Anyone with information was asked to email the Animal Cruelty Task Force at ACTF@lapd.online. Those wishing to remain anonymous can call Crime Stoppers at 1-800-222-TIPS (8477).